The Virginian witch-hazel is in bloom, displaying its delicate, ephemeral, spider-like flowers in the Gilbert Carter Woodland. This native of eastern north America was introduced to our gardens in 1736. It is something of a curiosity in that its floral impact is minimal as the flowers are often hidden by the foliage. It is only as the plant defoliates that the flowers are exposed. These are borne in clusters, in which each flower comprises 4 – 5 golden-yellow petals, approximately 1.5 cm in length. In the autumn the leaves can take on spectacular golden colours. 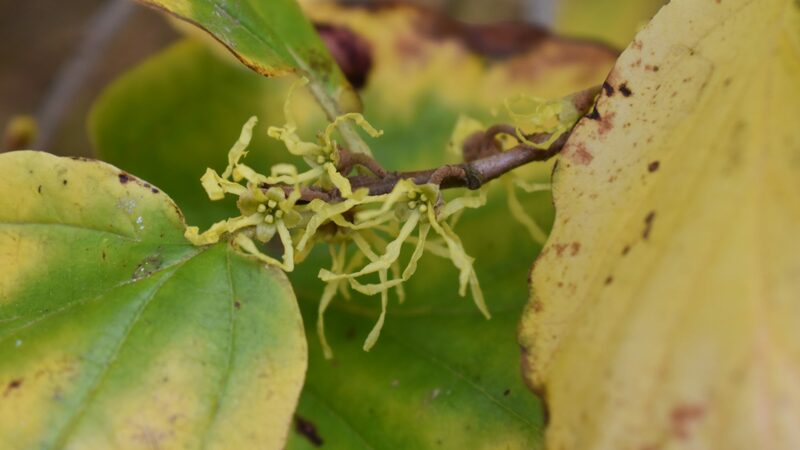 Extract from the bark and leaves was traditionally used by native Americans to produce an astringent, and witch-hazel still provides the base for widely available, commercial products.